CHASING FOOD DREAMS: Seasons Café, Grand Seasons Hotel Kuala Lumpur: A Double Celebration of Chap Goh Mei & Valentine’s Day! Seasons Café, Grand Seasons Hotel Kuala Lumpur: A Double Celebration of Chap Goh Mei & Valentine’s Day! To many lovers out there, this year’s Valentine’s Day falls on the same day as Chap Goh Mei, much to their dismay. Fear not, it may be a lovely opportunity to celebrate both special days together. After all, I found out this only happens every nineteen years. Anyhow, every day should be a special day for lovers and not just only once a year… if you get my jiff! Wink wink.. In honors of both Chap Goh Mei and Valentine’s Day, Grand Seasons Hotel Kuala Lumpur is going all out to whip up a feast of love and prosperity at the Seasons Café with their offering of a cosmopolitan mix of dishes. Foodies get to enjoy a spread of Chinese New Year dishes together with some lovey-dovey dishes in honor of the lover’s day too. My partner and I were invited to get a sneak peak at the cosmopolitan buffet that will be available on 14 February 2014, this Friday. Located at one of the busiest area in the heart of our city, we made our way there pretty easily. Seasons Café is an all-day-dining that has a 180 seating capacity. 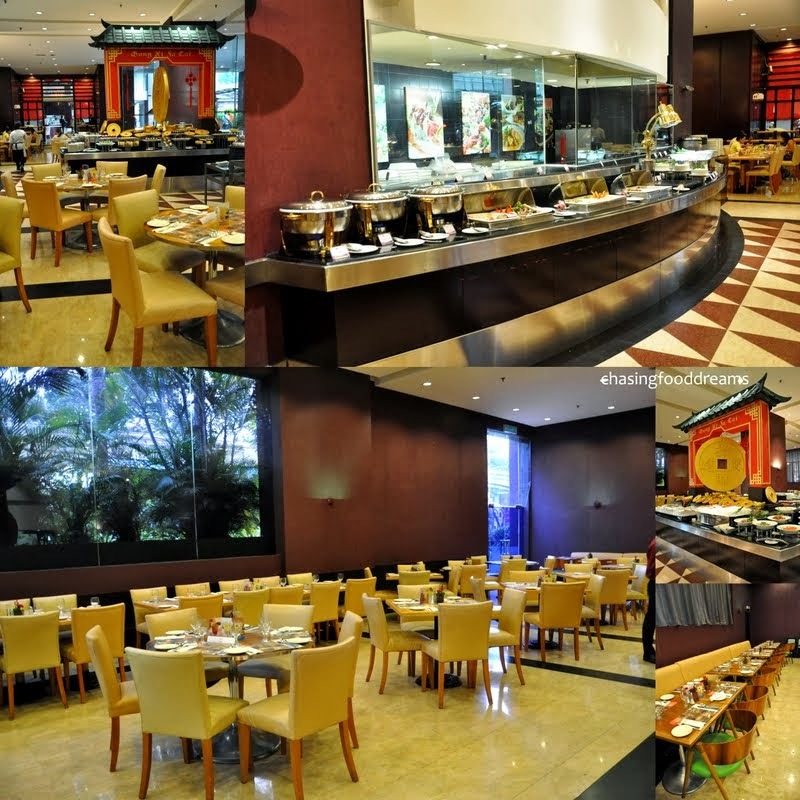 It offers a fusion buffet of East meets West. The ambience is comfortable and spacious. Since it was CNY, Seasons Café was really nicely dressed up with some festival décor to add to the festivity mood. We started off with some of the Chap Goh Mei and Valentine’s Day highlights of the buffet. The centerpiece that caught everyone’s attention was a double heart shape Salmon Yee Sang. As it is a DIY station, put on your thinking caps and get creative with your Yee Sang on this double happiness occasion! Kick start the buffet with its list of appetizers like Seafood Cocktail, Chinese Cold Cuts, Smoked Salmon with Capers on Spoon, Fresh Seafood on Ice, Sashimi and Sushi and more. I heard that there will also be a Nyonya favorite of Ju Hoo Char on Lettuce too! There are also Salad Bar and Rojak station for those who love their vegetables and fruits. Soup Bar features Chinese Fish Maw with Five Treasure Soup and a luscious Roasted Golden Pumpkin Soup. Nien Nien You Yue is a must and Chinese Chef Kendy Lee has prepared a Crispy Fish with his Signature Sauce dotted with cubes of fruits. A sweet and fruity version, this classic is executed really well with a nice balance of flavors. There will also be a Steamed Home Style Garoupa Head for those who prefer a lighter version of flavors. Prawns are another perennial favorite at this time of the year and Chef Lee has prepared Wok Fried Prawns with Patong Sauce for us that evening. More Chinese New Year dishes like Wok Fried XO Mussels infused with Bird Eye Chilies, Traditional Beggar Chicken, Stew Sea Cucumber and Fried Ngah Ku with Rainbow Vegetables will be available on hot buffet warmers. Western bar offers Carvery Station featuring Roasted Duck and Sesame Chicken. Enjoy Grilled Lamb Cutlets with Sauce, Grilled Saba Fish Fillet, Baked Cannelloni Gratin, Herb Marinated Beef Skewers with Smoked Gravy, Assorted Mushroom, Roasted Turned Potatoes with Beans and more. 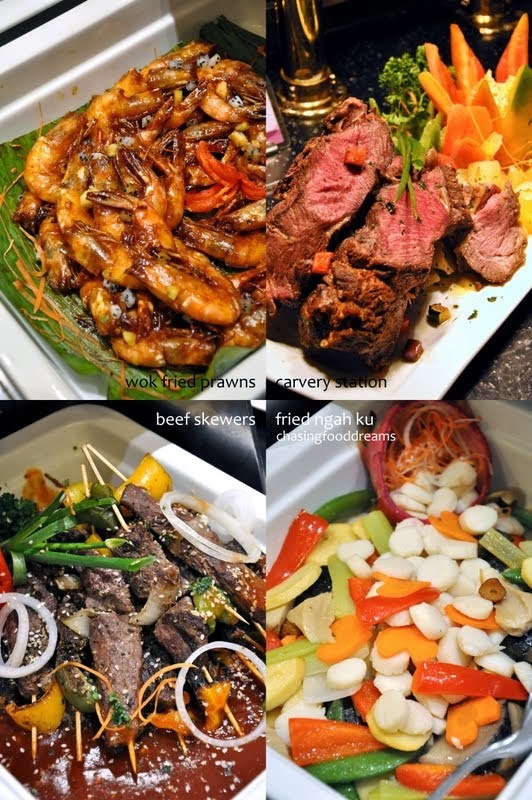 Hit live station for luscious Satay, Teppanyaki and Grilled Meats and Seafood. Other counters offer standard Noodle station and Malay cuisine featuring Curry Ayam Debal, Ikan Tenggiri Asam Manis Berkuah, Rendang Hati Lembu Tok Su and Patelis Terung Seri Rampai. End the sweet festive day with lots of love from the dessert bar. 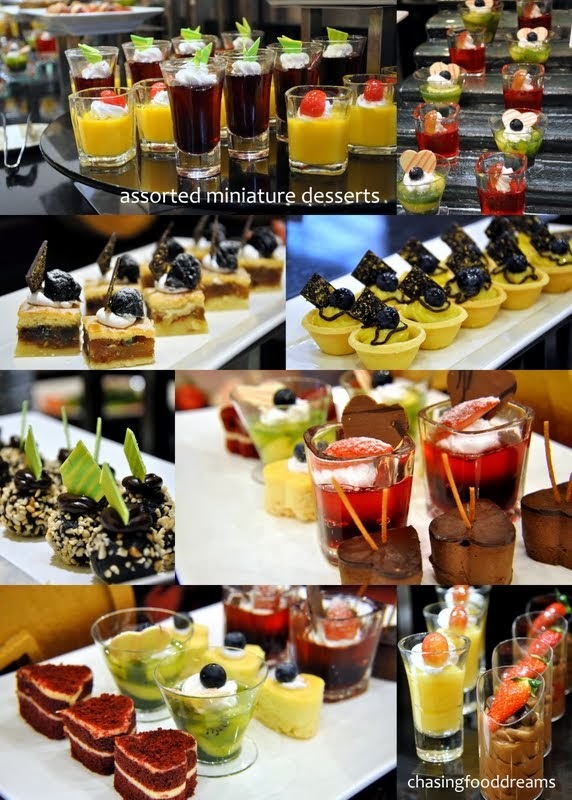 Featuring lots of international and local Miniature Desserts of puddings, cakes, jellies, tarts, kuih and more, there is something for everyone. Go Chinese and enjoy Deep Fried or Steamed Ningko, Tong Yuen in Syrup, Chinese New Year Cookies and Mandarin Oranges. There is even a fusion of Mandarin Orange Bread Pudding in the list. The Chap Goh Mei & Valentine’s day Buffet is available only in Seasons Café located at Ground Floor level, on the 14th February 2014 for RM78++ per person. For reservation, kindly contact the hotel staff at 03- 2697 8888 or email at reservations@grandseasons.com.